Happy Monday! Another month has now passed and I’m pleased to report that we’ve made a little more progress in paying off our debt. During July, we paid off £600 to our last creditor and that was because the hubby got paid early so we made August’s payment before the end of the July. That brings our debt total down to £13,373.74. 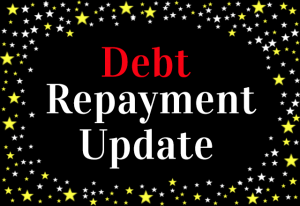 We wanted to get August’s payment through in plenty of time, because we’re expecting a phone call soon from our remaining creditor to review our financial situation again. You may remember that we had a tricky time with them a few months back because of our debt management plan and the fact that we wanted to increase our payment to £300 from £119. We were able to increase our regular payment so much because we successfully paid off our other debts. 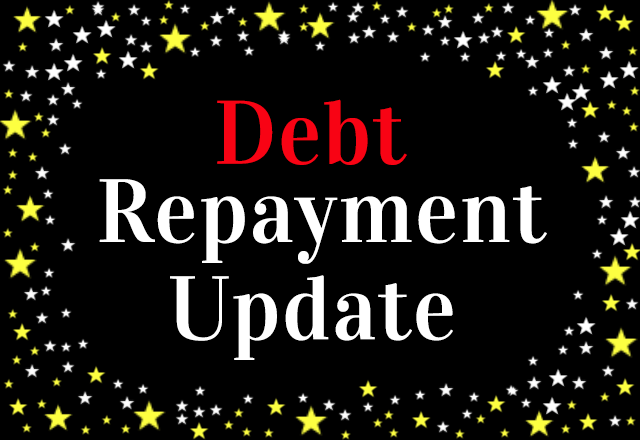 You can read all about what happened in May’s repayment update but here’s a quick recap for you anyway. Let’s just say that trying to increase our payment opened a can of worms resulting in this creditor believing we could pay more than £300 per month. The creditor didn’t seem to understand that my income fluctuates and we needed to make sure we can top up our emergency fund each month. Ideally what we wanted to do was to make payments over and above the £300 if we had a good month. But this creditor wanted a regular fixed amount each month and obviously we couldn’t commit to any more than that. So the hubby and I decided that we would save any extra money that we could get together each month to make a large over-payment in the future. That way, we’re not draining our emergency fund which we really do need to keep topped up for our car and our rental property both of which seem to need a few repairs at the moment. At the same time we’re preparing ourselves for the next review and this time we’re going to make sure that we have our figures ready and completely accurate. So how much did we save during July? During July, we managed to save £400, this was mainly due to the freelance work that I did in addition to my day job. The savings account is actually our emergency fund account as we didn’t open a new one. It’s gradually getting topped up and I really hope we can take some money out of the emergency fund account and make a big payment towards the debt soon. Our mission is still to become debt free by the end of the year. I’ll keep you all posted! How was July for you? Thanks Laurie, sorry to hear that July wasn’t great for you, I’m glad things are looking up for August. Bad months happen but the great thing is that you’re on track still with your main goals and things are going the right way. Brian @ Debt Discipline recently posted…Are you part of the 20 percent? Congrats! I think it’s great you are going to be debt fee by the end of the year. What a way to start the new year! Tonya@Budget and the Beach recently posted…Why Do We Touch a Hot Stove? Thanks Michelle! 🙂 Wow, earning nearly $15K during July sounds pretty awesome to me! You’re my inspiration as always! Congrats! It’s awesome that you’re able to devote your freelance earnings to the debt payoff journey! That’s super tough with the whole credit thinking you can pay more each month! Even so, you had an awesome month! Retired by 40 recently posted…Jen Glantz of Bridesmaid for Hire and thethingsilearnedfrom.com Interviewed me…. Yeah, this creditor is a bit of a headache unfortunately. We still haven’t had the long awaited review so we are just waiting for them to call us! Great job! You are really killing it. Debt and the Girl recently posted…Would You Change Your Career? Hayley, good job on your debt repayment stuff! July was still pretty expensive for me, hopefully I can cope up next month. Thanks Kate! Hope you have a better month during August! Tennille recently posted…Five Easy Ways You Can Start Saving Today! Keep on pluggin’ Hayley! You guys are doing great! Wow! The momentum is really starting to pick up. Soon we will be reading your “Debt Free” post. I really hope so Michelle – this debt is just the beginning of getting our finances sorted lol!